The 3rdSession of the United Nations Environment Assembly (UNEA) held from 4th to 6th December 2017, unanimously approved two important resolutions co-sponsored by Sri Lanka that called upon the global community to reduce toxic pollution sources that impact negatively on the environment, oceans and human health. The Sri Lanka delegation led by Mr. Anura Dissanayake, Secretary, Ministry of Mahaweli Development and Environment, made several important interventions during the UN Assembly Sessions and joined UNEP’s “Clean Seas Campaign,” alongside Chile, Oman and South Africa. UNEP’s Scientific Division team commended Sri Lanka for taking effective measures for reducing vehicle emissions and for improving the air quality in urban areas, in comparison to countries in the region. Mr. Dissanayake delivered the Country Statement, outlining its environmental achievements and future commitments. 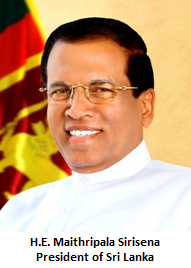 He emphasized that since the President of Sri Lanka holds also the portfolio of Environment, the Government on successive years, was able to introduce progressive environmental policies, culminating in the formulation of the National Budget of 2018 with an ambitious shift from fossil fuel dependency to a Circular Economy, under the theme Blue Green Enterprise Sri Lanka. This policy direction is taken with a view to compliment and further strengthen ongoing environment commitments in the next three years. In his Statement, the Secretary highlighted the ban on plastics, oxo-biodegrable plastics and extended polystyrene that came into effect from 1st September 2017 in order to safeguard the environment. Further, Government’s launch of Toxic Free Nation initiative to mitigate health hazards posed by excessive use of agrochemicals, pesticides, and weedicides and encourage organic farming and responsible practices in agriculture two years ago was also elaborated. 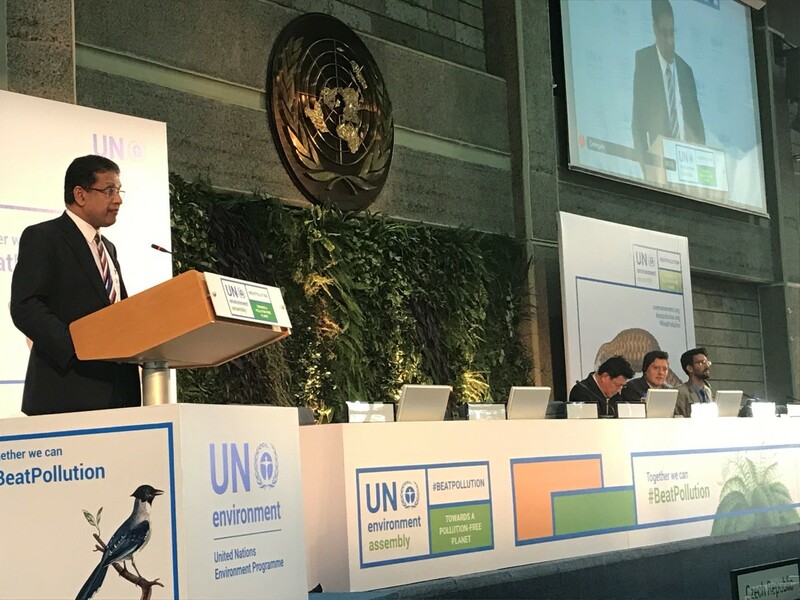 He also stated that, given Sri Lanka is a biodiversity hotspot, it embarked on an ambitious effort to add 200,000 hectares of new green cover as part of its commitment to the Bonn Challenge and achieve Land Degradation Neutrality by 2024. He added that efforts are taken to follow best practices in the field of Soil Management to increase soil fertility and land productivity. Mr. Dissanayake, reiterated as Sri Lanka is a member of the Minamata Convention on Mercury action is taken to phase-out mercury containing instruments in health sector, education sector and the jewellery industry. He also added that, the air quality of Sri Lanka improved with the use of lead free gasoline since 2002 and now Sri Lanka is striving to achieve Euro 4 standards by 2020. He further informed the Assembly, that the government of Sri Lanka with other South Asian countries is in the process of implementing a South Asia Oil Spill Contingency Plan. At the Assembly Sessions, Sri Lanka co-sponsored resolutions on Environment and Health as well as Marine Litter and Mircoplastics. The Delegation held extensive discussions on the sidelines of UNEA with Mr Erik Solheim, Executive Director, Ms Dechen Tsering, Regional Director and Representative for Asia and the Pacific, Ms Ligia Noronha, Director, Division of Technology, Industry and Economics, Mr Jian Liu, Chief Scientist of the United Nations Environment Programme and other officials. The Sri Lanka Delegation also paid a courtesy call on Ms Sahle –Work Zewde, Director General of the United Nations Office in Nairobi. They also met Mr. Tony Simons, Director General of World Agro Forestry Center and his team. From the Green Climate Fund, the delegation met with Dr Jerry Velasquez, Director and Mr Patrick Van Laake, Senior Ecosystems Management Specialist. The Sri Lanka delegation comprised of Ms Deepa Liyanage, Director (International Relations) of the Ministry of Mahaweli Development and Environment and Mr Dharmakirthi Christopher Mahinda Tilakasiri, CEO, Blue Green Economy Financial Facility and Ms Anzul Jhan, Acting High Commissioner, Sri Lanka High Commission, Nairobi.